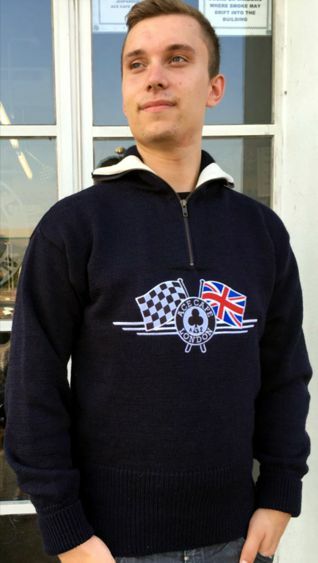 Ace Cafe London’s heavy knit, heritage wollen racing sweater is inspired by pioneers of motorsport and produced to the exacting standards that made them so popular, from their introduction in the 1920’s, all through the 40’s and into the 1950’s, as racing and club sweaters. The vintage turtle neck styling includes an authentic deep welt (hem) & turn-back cuffs with a thumb slot. This enables the cuff to be turned down during cold weather for added comfort. Made with 3-fold 100% pure new British wool, especially treated to prevent shrinkage, the inside of the zip closing collar has a 100% natural cotton twill band for durability and completes the classic timeless appearance. This superb quality sweater, with its richly embroidered Ace Cafe London and crossed flag logo on the chest, combines warmth, comfort and durability, and will last many years whilst retaining its all-important great looks!